Jolly Rancher candy inspires this drink. Founded in 1949, Jolly Rancher was a Colorado company that sold ice cream, candies and sodas in its shops around Denver and Golden. Their sour apple hard candy is something of a benchmark in early 1950s extreme flavor experimentation. The Jolly Rancher brand ended up in the hands of Hershey, but the flavor of their sour apples lingers on. Sweet and sour can do an intriguing balancing act on the palate. Apple pie is another sweet-sour flavor standard. This Apple Pie Soda takes the sharp tang of the best tart pie apples, Granny Smith, and adds a crusty spiciness to make a smooth mellow drink. The Granny Smith apples are left to sweat a good month or more after their purchase, to develop umami flavor through ripening and partial fermentation. When they are ready they will start to turn slightly yellow and yield easily to a thumb pushing down on their surface. Grind the apples to a pulp in a food mill or processor, put the pulp in a fruit press bag and squeeze out all the juice. Heat this with the honey to 75C (167F), add roots, herbs and spices. Cover cool and strain. Use the frozen syrup method with club soda to bottle the drink, age refrigerated for two weeks, serve with a scoop of ice cream if you like pie a la mode! 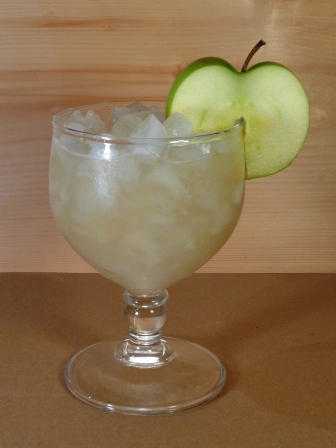 This entry was posted in soft drinks and tagged apple soda recipe, fermentation, homebrewing, soft drink, umami.